The Stromberg Carlson white Grab Handle Lends-a-Hand when you need it, giving you and your family a steady handle as you enter your RV. At the campsite when you are trying to climb the steep steps into your RV do you need a little help? 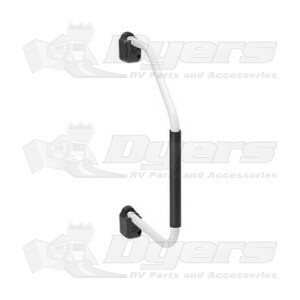 The White Lend-a-Hand Grab Handle from Stromberg Carlson is our most popular grab handle. The convenient easy to grab handle has a foam grip that gives you that extra security as you enter your motorhome, 5th wheel or trailer. The Stromberg Carlson Lend-a-Hand locks on the side of your coach to get you safely and securely in your RV. The Lend-a-Hand folds onto the side of your RV locking the handle into place as you go up and down the road the Lend-a-Hand stays in one place, without any tools! Here is what our loyal customers have to say about the white Stromberg Carlson Lend-a-Hand Grab Handle. At Dyers we have over 16 different handle designs from a truck load of manufacturers to choose from – the variety is endless! You are one step away from finding the perfect entry door handle to make your entrance and exit from your RV safely and more comfortable! Folds and locks to the side of your RV for travel. Lend-a-Hand rails measure 27.25" long (including mounting brackets) and protrude from the wall 15.5". fold it is lift it up and close it. I highly recommend this. Nice handle, like the way it folds next to camper when not using, or traveling. it is a great addition easy to install.